In an effort to keep the San Diego Opera from having its final curtain call, supporters of the opera found a very fitting way to address the San Diego City Council during a meeting Tuesday: through a song. During the public comment portion of the meeting, Nick Reveles, director of education and outreach for San Diego Opera, took a moment to speak to the council about everything the opera does for the community, including its work to bring arts education to children. He also touted the opera’s impact on the local economy. As Reveles spoke, about 50 members of the White Knight Committee (WKC) – a grassroots movement to keep the opera afloat – and members of the San Diego Opera Chorus and looked on. Applause erupted from the council, including Marti Emerald, Todd Gloria and David Alvarez, as the chorus finished singing. On Mar. 19, the San Diego Opera Board announced the opera would be closing in mid-April due to “insurmountable” financial issues. Last week, board members voted to delay the planned closure by two weeks, until Apr. 29, so they could explore alternative solutions. Since the announcement of the impending closure, the WKC formed to fight to save the opera. The committee is comprised of opera staffers, union locals, seasonal employees, vendors and supporters. An online petition to save the opera was also launched a couple of weeks ago. As of Tuesday, it had collected more than 20,600 signatures. On Tuesday before the council, members of the WKC talked about the economic impact of the San Diego Opera, saying that if it shuts down, more than 400 people will lose their jobs and local businesses and San Diego tourism will also lose money. Also, students will miss out on arts and opera education programs in the classroom. 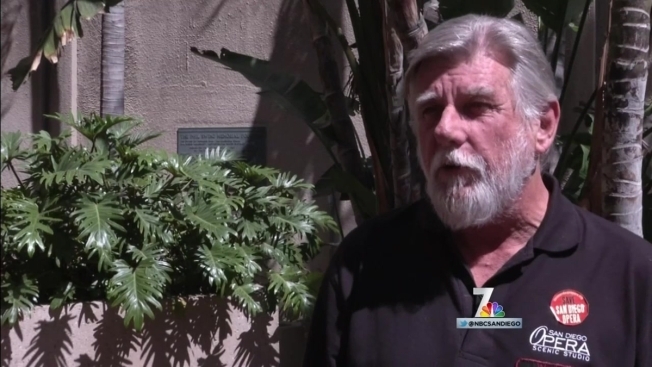 After the city council meeting and, NBC 7 spoke with John David Peters, who has worked for the opera for more than 40 years. He said going before the council with a powerful performance was just another step in saving the company from closure. “What we were doing today was trying to communicate to everybody that opera is not just a rich kid’s toy. It’s a critical part of our cultural community,” said Peters. Peters also echoed that the opera plays a big role in the local economy, specifically with jobs. "What's going to happen is that the City of San Diego is going to be poorer when this company closes because [opera employees] are going to have to find full time employment, perhaps in other communities. They're going to sell their houses, they're going to move out and you're going to lose five or six hundred people,” he said. On top of that, Peters also said it’s important for the council and the city to know about the positive impact the San Diego Opera has on younger generations. Native San Diegan Rita Cantos Cartwright, for example, grew up going to the opera and has been singing in it for more than 25 years. Her concern is the impact the closure will have on future artists. "You know, we have four major university and college programs now in opera in this town. And they're very competitive here. Where do they go?" she said. For now, supporters of the opera say their battle isn’t over and they’ll keep pushing to keep the opera alive. "All I can do is fight for what I believe in and know full well that having opera in this community is an essential corner-stone to our cultural arts," added Peters. On Friday, San Diego Opera board member Carol Lazier donated $1 million to the opera to encourage the board to rescind their vote to close the company. However, Board President Karen Cohn said the opera would need at least $10 million to put on its 50th anniversary season next year. Before this recent two-week extension, the opera was set to begin shutting down operations next week, after its final performance of “Don Quixote” on Apr. 13.